Sometimes called Hallertau Hersbrucker as the Hersbruck region is right next to the Hallertau region and Hersbrucker is grown in both regions. A hop that represents a large acreage in Germany and what has essetially replaced traditional Hallertauer hops as they were more susceptible to disease. Hersbrucker gives you classic noble type German hop flavor. Expect spice, fruit and floral characteristics. Often used as an aroma hop, Hersbrucker has a low alpha acid percentage but generous oil content. Great for Lagers, Pilsners, Bocks, Belgian Ales, Kolsch, Munich Helles, and Lambics. Making a beer using these hops. be careful of the AA, the 2oz I recieved was rated at 1.7; specs say 2-5, most software has it around 2.5. 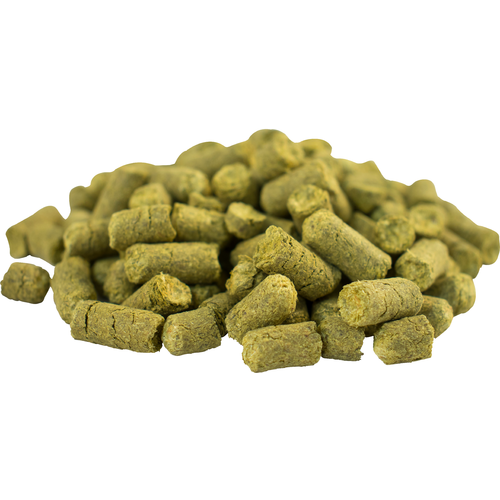 If you've made a recipe with 2.5 AA then go back and dbl check you may need slightly more hop to achieve same IBU.